Spring is finally here and it seems that the weather is cooperating too. After such a damaging cold winter, we have lots to do to get our landscapes back in shape. Plants should be starting to sprout new growth so that we can finally determine the extent of the freeze damage. This is the time of year when we want to refresh the landscape by pruning away any freeze damage, cleaning up plant debris that collected under plants during the winter, planting annuals for spring and summer, and applying a fresh layer of mulch. Freezing temperatures caused many lawns to turn brown especially in areas that were the most exposed. You should be seeing new growth from the grass that is still living by now. You might find that there are areas that will need new sod or plugs to repair areas that are do not sprout. Do not "scalp" the lawn to remove the grass that has turned brown. You may remove living growing points that are protected by the brown grass blades. Wait until you see good green growth to put down fertilizer. Use a product with 50% slow release nitrogen in a formula like 15 - 0 -15. Pinellas County has passed a fertilizer ordinance that will ban fertilizer usage on lawns from June 1 – September 30, so using a slow release fertilizer is very important. Remember to mow your grass at the highest recommended height for your grass type. Most leaves can be left on the ground and covered with new mulch. They will add to the organic matter in the soil as they decay. If plants showed signs of disease or there is fruit on the ground, cleaning up this debris is perhaps the single most important thing you can do to manage many of the leaf-spotting, powdery mildew, bud and flower blight, and canker causing fungi. Many of these fungi overwinter on plant debris. Wind, irrigation and rain can disseminate spores from this over wintering fungi to other areas of the garden or landscape. Camellias and azaleas are susceptible to petal blight causing the flowers to turn brown and rot prematurely. 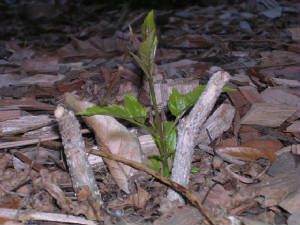 All fallen buds, flowers or petals should be removed from under the plants as soon as possible. On camellias especially, if buds or flowers turn brown on the plant, remove as soon as you notice them. Contaminated tools can also contribute to the spread of disease. Tools used to prune plants should be disinfected after each use by dipping the cutting surfaces in a solution of one part bleach to nine parts water. Rubbing alcohol (70%) from the drug store will also work and does not require diluting. If you have a lawn service that does your pruning, ask that they disinfect their tools prior to using them in your yard. In perennial beds you should start to see new growth. Remove old flower heads, stalks, and any diseased plant parts. Examine roses for dead canes and remove them and prune other canes back to where you see healthy new growth if this was not done earlier. Annuals planted in the fall, such as snapdragons, petunias, pansies or geraniums, will benefit from a light pruning and an application of balanced slow release fertilizer. You should see a new flush of blooms that lasts into May. Gazania, Marguerite Daisy, Marigold, Pentas, Salvias, Dianthus, and narrow-leaf Zinnia are some good annuals to plant in April for color through spring and into the summer. Gaillardia is a really drought tolerant native flower that can be seeded directly into the ground near the end of March that will provide drought tolerant flowers all summer long. If you have shady areas where you want some color; select Caladium bulbs as soon as they are available for wonderful leaf colors. When all of your clean up efforts are finished, put down a fresh layer of mulch. Be careful to keep the mulch a couple of inches away from the base of plants and not more than two to three inches deep. It is not necessary to remove old mulch beyond raking up diseased leaves and plant debris. Old mulch continues to decay, releasing organic matter and nutrients into the soil. A beautiful garden takes a lot of work, but you should be rewarded with results that are worth the effort! Growing blueberries in Florida’s sandy soils is sometimes problematic since the pH of our soil tends toward neutral or alkaline. Blueberries require an acid pH soil. But, you can grow them in pot by using a soil mixture created to provide the perfect acidic pH environment that they require. There are some cautions however. There are two species of blueberries that grow well in Florida – Rabbiteye and Southern Highbush. For the Tampa Bay area the Southern Highbush is the one to choose. These were bred to produce fruit despite our warmish winters. I have seen both species for sale in the Tampa Bay area, so buyer beware and read the labels carefully. For the majority of blueberry bushes, you will need two different cultivars within the species for cross pollination to set fruit. Choose the two cultivars carefully by bloom time so that they will both be blooming at the same time. 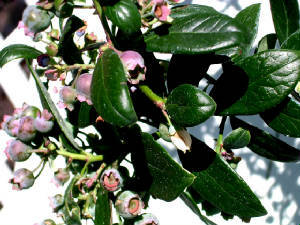 The University of Florida/IFAS Blueberry Gardener’s Guide (http://edis.ifas.ufl.edu/MG359) lists cultivars and their bloom and fruit dates. There is one exception to this two cultivar requirement – the Southern Highbush cultivar ‘Sunshine Blue’ is self pollinating and also dwarf in size – just great for containers. They are harder to find – a good source is Parks Seed by mail order in spring. In addition, I found ‘Sunshine Blue’ plants for sale at Lowe’s on March 1st. ‘Sunshine Blue’ grows about 3 – 4 feet tall and wide. For planting, choose a large pot with good drainage holes in the bottom. A good soil mixture is 1 part sand, 1 part peat and 1 part milled pine bark – adding some compost is also beneficial. Water is crucial, especially during the bloom and fruit season. But be careful to not overwater; root rots are a common cause of blueberry plant death. Water only when the top 1 inch of soil is dry. Fertilize cautiously also. Use a blueberry special or camellia – azalea fertilizer in small amounts every two months from April through October. Do not put fertilizer in the planting hole – it could burn the tender roots. With proper care, you will be enjoying blueberries next year.